Camping Nature Parc l’Ardéchois is a very high quality, family run site within walking distance of Vallon-Pont-d’Arc. 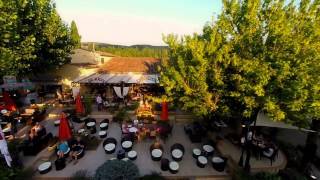 It borders the River Ardèche and canoe trips are run, professionally, direct from the site. This campsite is ideal for families with younger children seeking an active holiday. The facilities are comprehensive and the central toilet unit is of an extremely high standard. Of the 250 pitches, there are 225 for touring units, separated by trees and individual shrubs. All have electrical connections (6/10A) and with an additional charge, 125 larger pitches have full services (22 include a fridge, patio furniture, hammock and free WiFi). Forming a focal point are the bar and restaurant (excellent menus) with an attractive terrace and a takeaway service. A member of Leading Campings group. There is also a heated pool complex and sunbathing terrace. For children, there is a well thought out play area plus plenty of other space for youngsters to play, both on the site and along the river. Activities are organised throughout the season; these are family based – no discos. Patrols at night ensure a good night’s sleep. Access to the site is easy and suitable for large outfits. 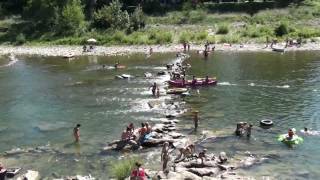 The campsite is ideally situated near the Pont-d’Arc, a huge arch of limestone in the Ardèche Gorge. The local tourist centre of Vallon-Pont-d’Arc is within comfortable walking distance. A worthwhile trip down the gorge by car passes a number of spectacular viewpoints with good parking. Two very well equipped toilet blocks, one superb with everything working automatically. Facilities are of the highest standard, very clean and include good facilities for babies, children and disabled visitors. Laundry facilities. Four private bathrooms to hire. Well stocked shop. Excellent restaurant, bar and takeaway. Heated swimming pool and paddling pool (no Bermuda shorts). Wellness area with sauna, hammam, jacuzzi and 4 seasons-shower. Different types of massage and treatments. Yoga. Gym. Tennis. Very good play area. Organised activities, canoe trips. Bicycle hire. Only gas barbecues are permitted. Communal barbecue area. WiFi throughout (charged). From Aubenas take the D579 towards Ruoms. Continue south on D579 at Ruoms towards Vallon-Pont-d’Arc (western end of the Ardèche Gorge) at a roundabout go east on the D290. Site entrance is shortly on the right.